Blairsville-Union County is home to three gorgeous waterfalls: Helton Creek Falls, Trahlyta Falls and DeSoto Falls, located just outside of Union County. These waterfalls all provide easy access with viewing areas, parking and a short walk or hike to view the falls. Helton Creek Falls (pictured above): The Helton Creek Falls Trail is an easy .2 mile hike. The lower falls drops over a 30' ledge, tumbling to a pool below. The second upper falls is a tall, full falls that drop at least 60 feet. Please be advised there are many abrupt changes in grade along this short walk. Please stay on the trail and observation deck! Directions: From Blairsville, take US 19/129 south for 11.5 miles. Turn left on the first paved road past the entrance to Vogel State Park. (Look for Helton Creek Waterfall sign on right side of highway) Go approximately 1/2 mile on paved road and then continue on a gravel road approximately 1.5 miles (stay to the right at fork in the road, you will travel through the forest quite a ways) to a small pullout parking area. Trailhead will be on right as indicated. Trahlyta Falls at Vogel State Park: Located directly below Lake Trahlyta, this waterfall located in Vogel State Park is a stepping stone waterfall that falls 40 feet. The trail is a 1 mile loop trail short and steep, but worth the effort. Directions: From Blairsville, take US 19/129 south 11 miles and turn right into Vogel State Park. The falls are located on the north side of Lake Trahlyta, named for a Cherokee maiden who is buried a few miles from the park at Stonepile Gap. Desoto Falls: There are two waterfalls along the 1.5 mile DeSoto Falls Trail. The lower falls cascade about 20 feet. The upper, and most scenic, falls drop 80 feet. Both are accessed by a maintained trail leading from the day use parking lot. Visitors can hike to view these waterfalls. DeSoto Falls was named for the Spanish explorer Hernando De Soto because a piece of armor attributed to his expedition was supposedly found in the area. Located in rugged mountains with awesome views, elevations in this 650-acre area vary between 2,000 and 3,400 feet. Directions: From Blairsville, take US 19/129 south about 15 miles from Blairsville to the DeSoto Falls Recreation Area on right. Want to know more about waterfalls in Union County and North Georgia? 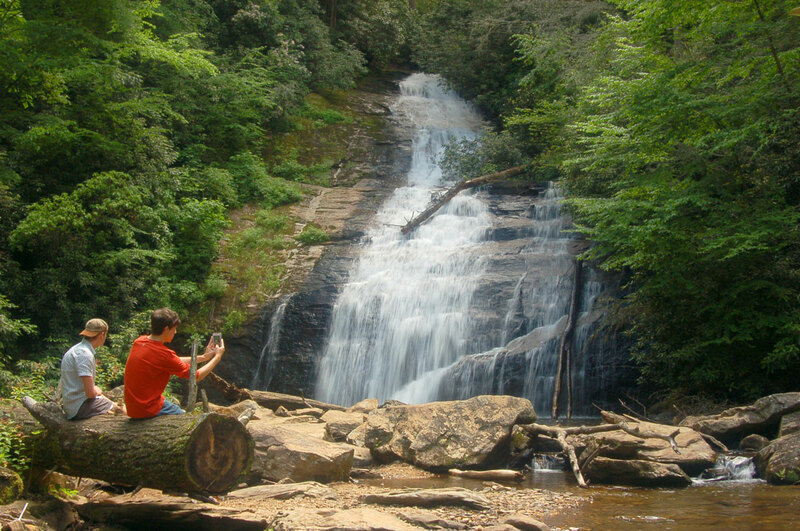 Download the North Georgia Waterfall App available on Google Play or the iTunes App store.